Rennzweier (The Double Racer) is a veteran automobile manufactured by Nesselsdorfer Wagenbau-Fabriks-Gesellschaft A.G. (now known as Tatra) in 1900. It is sometimes also called First racing, 12 HP or Rennwagen (The Race Car). 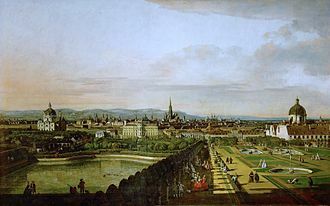 It was commissioned by baron Theodor von Liebig. Hans Ledwinka, the man behind the famous rear-engined Tatras, and at the time only 20 years old, took part in constructing the car. The car was manufactured on May 5, 1900, and the manufacturing process took only 5 weeks. 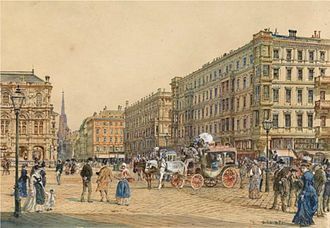 In 1899, the NW-cars Wien and Nesselsdorf (descendant models after the Präsident), achieved their first significant racing success on the trotter course in Vienna Prater. 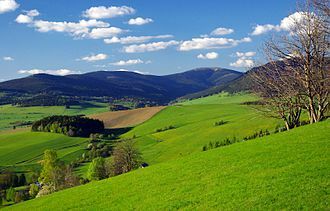 It was the first ever race under the Austrian monarchy - starting on October 23, 1899. 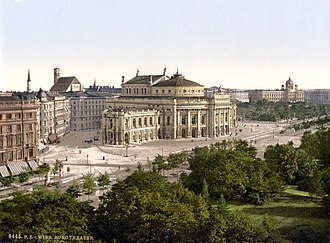 The driver of the winning NW-car Wien was baron Theodor von Liebig. The other NW-car Nesselsdorf was the second one before all competitors consisting of four Benz-cars and four Dietrich-Bolleé cars. Later, in March 1900, Liebig raced the triangle 192 km track Nizza - Draguignan - Nizza, where he won the second stage outright. Four days later he won the class of four-seaters up to 1000 kg in famous hill climb race Nizza - La Turbié. Based on this achievements, baron Liebig ordered the construction of a new automobile. While the previous cars Liebig used in races were built as common cars, the one he ordered was to be designed as a pure race car. 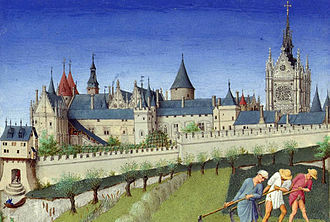 The construction was unique at the time. The car was very low, especially the driver's seat. There was no bodywork - all mechanical parts were uncovered. Unlike its predecessors, the steering column was slightly tilted. The car had modified Benz engine. It was a two cylinder spark ignition engine with a power output of about 9 kW (12HP) at 1800RPM. It was transversely mounted above the driven rear axle. The driver was situated on a heightened seat behind the steering wheel, while the passenger seat was much lower on the frame, so the passenger's legs were sticking out under the car. The gas tank had a volume of 42 liters, while there was also another tank behind the driver for 15 liters of coolant. The car was able to reach a maximum speed of 82 km/h. Von Liebig raced the car in numerous contests. He won the La Turbie race that took place in Nice, and took second position in Salzburg-Linz-Vienna race. He later also took part in the Paris-Vienna race. Today the Rennzweier is exhibited at the Czech National Technical Museum. A second racing car was made in 1901. This one also made do without bodywork, and this time featured a Hardy engine (flat two, 3188cc, 7,4 kW-8,85 kW (10-12HP)) was used instead of the previous Benz one. 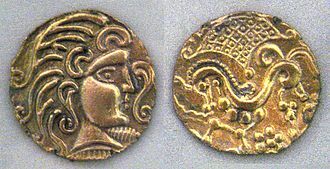 Wikimedia Commons has media related to NW Rennzweier. Tatra is a Czech manufacturer producing vehicles in Kopřivnice. It is owned by the Tatra Truck company, based in Ostrava, the company was founded in 1850 as Ignatz Schustala & Comp. Later renamed Nesselsdorfer Wagenbau-Fabriksgesellschaft when it became a wagon and carriage manufacturer, in 1897, Tatra produced the first motor car in central Europe, the Präsident automobile. During World War II Tatra was instrumental in the production of trucks, production of passenger cars ceased in 1999, but the company still produces a range of primarily all-wheel-drive trucks, from 4×4 to 18x18. The brand is known as a result of Czech truck racer Karel Loprais. 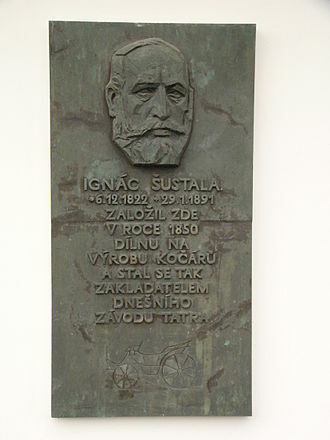 Ignác Šustala, founder of the company in Kopřivnice, Moravia, in 1891 he branched out into railroad car manufacture, naming the company Nesselsdorfer Wagenbau-Fabriksgesellschaft, and employed Hugo Fischer von Roeslerstamm as technical director in 1890. After the death of Šustala, von Roeslerstamm took over running the company, using this for inspiration, the company made its first car, the Präsident, which was exhibited in 1897 in Vienna. Orders were obtained for more cars and under the direction of engineers Hans Ledwinka and Edmund Rumpler, ten improved cars were made. The first car to be designed by Ledwinka came in 1900 with the Type A with rear-mounted 2714 cc engine. This was followed by the Type B with central engine in 1902 and he returned in 1905 and designed a completely new car, the Type S with 3308 cc 4-cylinder engine. Production was badly hit in 1912 with a 23-week strike and Hugo Fischer von Roeslerstam left the company, after World War I Nesselsdorfer Wagenbau was renamed Kopřivnická vozovka, and in 1919 the name Tatra was given to the car range. Leopold Pasching took over control and in 1921 Hans Ledwinka returned again to develop the revolutionary Tatra 11, the new car, launched in 1923 featured a rigid backbone tube with swinging semi-axles at the rear giving independent suspension. The engine, front-mounted, was an air-cooled two-cylinder unit of 1056 cc, the Tatra 11 was replaced in 1926 by the similar Tatra 12 which had four-wheel brakes. A runabout is a car body style that was popular in North America until about 1915. It was a light, basic style with no windshield, top, or doors, runabouts eventually became indistinguishable from roadsters and the term fell out of use in the United States. The approach has evolved into the city car. The runabout was a light, open car with basic bodywork and no windshield, most runabouts had just a single row of seats, providing seating for two passengers. Some had a seat at the rear to provide optional seating for one or two more passengers, those without rumble seats may have had a trunk platform, a box. They differed from buggies and high wheelers mainly by having smaller wheels, early runabouts had their engines under the body toward the middle of the chassis. This sometimes made difficult, as on the Oldsmobile Curved Dash where the body had to be removed in order to access the engine. The Gale runabout dealt with this problem by hinging the body at the rear of the car such that it could be tilted to access the engine, some runabouts had the engine in what became the conventional position at the front of the car. Runabouts were popular in North America from the late 19th century to about 1915 and they were designed for light use over short distances. By the mid-1910s, they became almost indistinguishable from roadsters, the 1964 GM Runabout was a three wheel concept car first exhibited at Futurama II, part of the 1964 New York Worlds Fair. The car was designed specifically for housewives and had detachable shopping carts built into it, the term runabout is still in use in Britain, denoting a small car used for short journeys. Anderson, Crozier, Gilmour, Grandison, Alice, McKeown, Stibbs, Summers, Elspeth, N.1 a small car used for short journeys Clough, Albert L. New York, NY USA, E. P. Dutton, a general term for a light two-passenger car of the early 1900s. Haajanen, Lennart W. Illustrated Dictionary of Automobile Body Styles, the story of Veteran & Vintage Cars. Chapter One The Pioneer Days 1769 –1904, the Oldsmobile merits its niche in history as the first true example of mass-production, some 3,750 being turned out in 1903 alone. Tatra 30 is an auto-mobile formerly made by the Czech manufacturer Tatra. It was manufactured between 1926 and 1928, from 1928 to 1931 the car was fitted with newer engine and is therefore called Tatra 30/52. Tatra 30 was powered by an OHV air-cooled four cylinder boxer motor of 1679 cc, positioned at the front, the maximum speed was around 90 km/h. Tatra 30 Sport was powered by engine of similar architecture but with 1910 cc and this version was capable of speeds up to 130 km/h. During the modernization process the 52 engine was fitted and it had 1911 cc and 22 kW. This was a transitory mid-version before the production of the successor fully began and it was manufactured for a period of about one year. Tatra 30 was gradually modernized until it was replaced by Tatra 52, power was delivered to the rear wheels via a four speed gear-box. The drive shaft is situated inside the backbone tube, the gearbox and engine is mounted in front of the backbone tube, while the differential is at the back. Tatra 30 was in the size category. The Czechoslovakian Tatra 77 is the first serial-produced, truly aerodynamically-designed automobile. It was developed by Hans Ledwinka and Paul Jaray, the Zeppelin aerodynamic engineer, launched in 1934, the Tatra 77 is a coach-built automobile constructed on a central tube-steel chassis and is powered by a 75 horsepower rear-mounted 3. 4-litre air-cooled V8 engine. The average drag coefficient of a 1,5 model of Tatra 77 was recorded as 0.2455, the Tatra Company began manufacturing cars in 1897 in Kopřivnice, todays Czech republic, making it the third oldest still existing automobile manufacturer in the world. Under the direction of Hans Ledwinka, the company employed many genius minds of history, including Erich Übelacker and consultant Paul Jaray. Paul Jaray first worked at Luftschiffbau Zeppelin where he gained experience in the design of airships. He used his access to LZs wind tunnels and subsequently established streamlining principles for car design, in 1927 he founded a company specializing in developing streamlined car bodies and selling issuing licences to major vehicle manufacturers. Tatra was the manufacturer to incorporate Jarays streamlining principles into their series car production. Before designing the large, luxurious T77, Jaray designed a body for the Tatra 57. 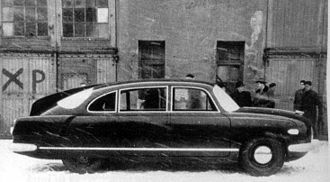 This prototype was not further developed and failed to reach production, Jaray constructed two prototypes for a concept designated as the Tatra V570, which more closely conformed to his aerodynamic streamlining principles, featuring a beetle-shaped body. Ledwinkas team subsequently stopped work on the V570 and concentrated on designing large, Tatra aimed at making state-of-the-art cars that would be fast, nearly silent and built to the most rigorous engineering standards, as well as reflect modern aerodynamic research. Hans Ledwinka was the designer responsible for the development of the new car. 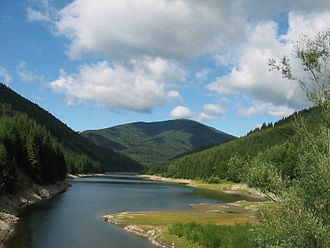 Development was very secretive until the last moments of the presentation on March 5,1934 at Tatras offices in Prague. That same year the T77 was presented at the Paris motor show, director Maurice Elvey was so amazed by the looks of the car that he used the T77a in his science-fiction movie The Transatlantic Tunnel. The Tatra T11 was the first Tatra model to use the unique combination of major components that are still in use on the trucks produced by Tatra to this day. Hans Ledwinka created the design of the T11 while working for Steyr in Austria and he believed there was a need for a small car, and carried out the work in his own time. His design offered to the Steyr management was rejected and he left the company soon after to work for a previous employer, Nesseldorfer, in Moravia, soon to become Tatra. This was in 1921 and the development of the T11 started soon after, the T11 was produced between 1923 and 1927 with 3,847 examples made. It was replaced by the T12 a development of the design,7,222 being produced by 1936 when it was discontinued. The Tatra T11 had its engine and gearbox in unit, bolted to the front of a tubular backbone with propeller shaft enclosed, the T11s engine was an air-cooled horizontally opposed twin cylinder engine with overhead valves. It had a capacity of 1,057 cc and was located above the front beam axle which was attached to it by a transverse leaf spring. Tatra 17 is a vintage automobile produced by the Czech manufacturer Tatra from 1925 to 1929. 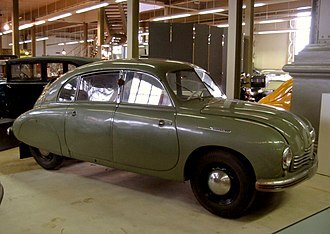 It was the companys top-end model which was alongside the economy car Tatra 12. Originally, the car was fitted with a liquid-cooled six-cylinder OHC in-line Tatra 17 engine with 1,930 cc and 35 hp power, the block was made from silumin and cylinder heads from aluminium. 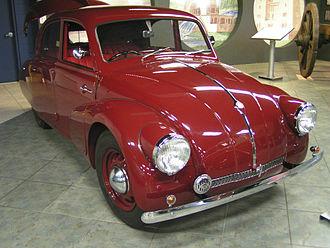 It was the first Tatra with an ignition battery, the maximum attainable speed of the 1,130 kg heavy car was 100 km/h. Altogether 205 vehicles were made before 25 September 1926, another engine used was from even more up-market Tatra 31. It was a liquid-cooled six-cylinder in-line OHC, however this time with 2,310 cc and 39,4 hp power, the maximum speed was raised to 110 km/h. 250 vehicles were made with this engine, Tatra 17/31 was for some time manufactured alongside the successor model Tatra 31, of which 300 vehicles were made. Model 17 was the first luxury Tatra with a backbone tube, unlike model 11, the Tatra 17 had independent suspension not only of the rear half axles, but independent suspension of the front axles. A 1940 Tatra 87 Saloon, showing the identifiable rear 'Sharks-fin' and lack of rear windows. The entire rear segment of the Tatra 87 formed an engine cowling. 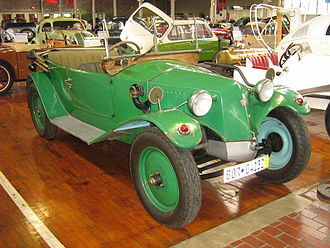 Backbone chassis, developed by Hans Ledwinka in 1923 for Tatra. The company uses the modernized concept to this day.